I am halfway through my second week of marathon training. I just completed my 26k long slow run last night. It went good. Surely, I have tired legs today, but all is within expectations. I am not flat on my back. That's all I want. My food intake has been increasing steadily since I started the training. Muffins have become a staple in my diet again. 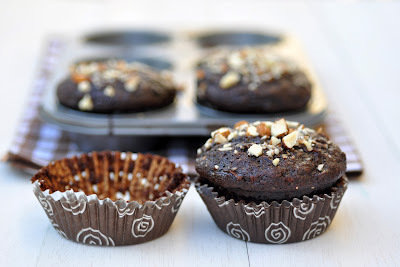 I am very proud of these chocolate carrot muffins, because I seldom succeeded in making good chocolate muffins. In fact, almost without fail, they turned out too dry, not sweet enough, not chocolaty enough. This chocolate muffin recipe is the yummiest I have ever made. On top, they are gluten-free and dairy-free. Perfectly moist. My kids love them as much as I do. Which results, in me baking batch after batch, if I am not busy running or eating. Or sleeping. The three most basic basics of life.